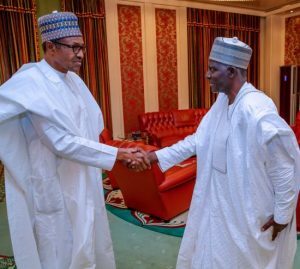 President Muhammadu Buhari has met, for the first time, with the newly appointed Director-General of the Department of State Services, Yusuf Magaji Bichi, at the Presidential Villa, Abuja. When Bichi was ushered into the president’s office by protocol officials,The President threw a banter at the new Director General if they had met before. The new DG, however, `confessed’ that he was seeing President Buhari face-to-face for the first time in his life. The meeting of the president and the DSS boss went into a closed door session.